Chittagong University (CU) Vice Chancellor (VC) Professor Dr Iftekhar Uddin Chowdhury called upon campus journalists to fight against drug, terrorism and militancy through their write-up. 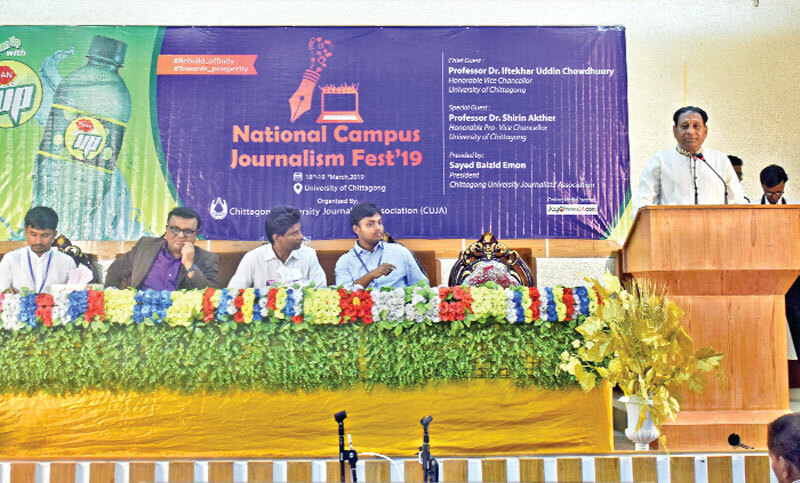 He said this while addressing as the chief at the inaugural ceremony of two-day programme titled ‘National Campus Journalism Fest-2019’ on the university campus on Monday. CU Journalists’ Association (CUJA) organised the programme also attended by the CU Pro-VC Professor Dr Shireen Akhter, Bangladesh Federal Union of Journalist (BFUJ) Vice President, private television channel Gtv and online news portal sarabangla.net Editor in-Charge Syed Ishtiak Reza, CU Proctor Ali Asgar Chowdhury and Communication and Journalism department Chairman Associate Professor Abul Kalam Azad as special guests. Addressing the programme, CU VC observed that news will have to be impartial for welfare of people. Putting up role of journalists in building nation, he urged the young newsmen to remain alert so that the noble profession can’t be tainted by dishonest persons. Over 200 correspondents of 23 journalist organisations from different universities across the country attended the programme. With the CUJA President Sayed Baizid Emon in the chair, former CUJA leaders addressed the programme conducted by its Publicity, Publication and Office Secretary Jobayer Chowdhury.